What is a "part number"? A part number is a code the uniquely identifies an inventory item. The purpose of this code is to help us refer to that specific item without knowing additional information such as manufacturing machine, machine brand, inventory part size etc. Battery capacity can be described as the electrical energy content, which is usually expressed in milliAmpere-Hours (mAH). This is determined by the amount of electrical energy the battery has capacity to deliver – under stated conditions of temperature, rate of discharge and final battery voltage, all over a specific time period. As one might guess, the higher the battery capacity rating, the higher the MaH, and the longer the battery will last. Thus, for laptop computers and other portable devices that are used for long periods of time, batteries with higher capacities are preferred. A volt is a measure of electrical pressure or force. Referred to as “V” for voltage, different volts or voltages will be found in batteries of different chemistries. For instance, NiCd and NiMH batteries are nickel based, providing a cell voltage of approximately 1.2 V, while a Li-ion cell provides 3.6V/3.7V. With that said, the voltage of two battery cells of the same chemistry is always the same. While their capacities may differ, the voltage always remains the same. Likewise, it is crucial that the voltage of a cell or a battery pack always mirrors that of the voltage requirement of the device in which it is used. If there is a difference between the two, the device will malfunction and enough malfunctions may also cause permanent damage. Are Li-ion batteries affected by “Memory Effect”? Quite simply, no – Lithium ion batteries are not affected by “Memory Effect.” Such an action would result in a drop in the capacity or voltage of a rechargeable battery. While Li-ion batteries are not impacted by “Memory Effect,” it does impact NiCd and NiMH because they are nickel-based. Thus, laptop users can become quite rustrated with unexpected downtimes. When a battery loses its charge when it’s not in use, it’s referred to as a self-discharge. If a battery sits without being used, it will lose its charge, and this self-discharge is at its highest following a full charge of a battery at full capacity. There are other factors that impact the rate of self-discharge, including temperature of where the battery is stored and even the humidity present. And this is true regardless of battery type or chemistry. Li-ion batteries have the lowest self-discharge rate – 5% to 10% per month; quite low compared to 20% of the NiCd, 30% of the NiMh. When you calculate the number of times a battery can be charged and discharged before it fails, you are measuring battery life cycle. Thus, one battery cycle is defined as a full charge that is followed by a full discharge. Battery life, as one might suspect, is a measure of the number of battery cycles a battery can provide before it “dies” and needs to be completely replaced. Battery life varies between chemistries, but Li-Ion batteries generally provide around 500-700 charge/discharge cycles. Heat and metal objects do not act well with laptop batteries. Best practices include removing laptop batteries and storing them in a dry and cool storage space. When stored, batteries should be discharged to 40%. Prolonged storage of Li-ion batteries for more than three months is not recommended. 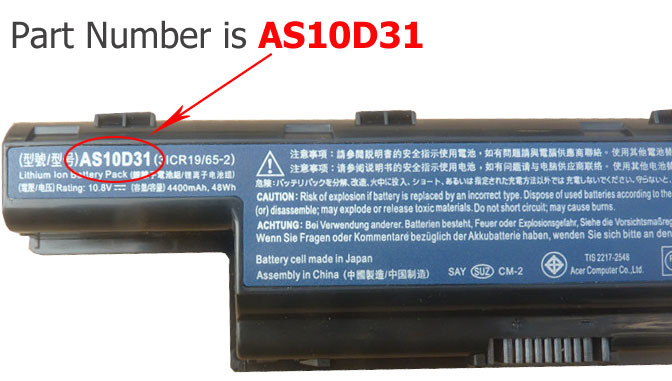 As can be seen in the picture to the below this Acer battery shows that it's a Li-ion battery, has a model number of Li-ion, rating of 10.8V, 4700mAh,50Wh, Part number "A32-K55"